Saint John's Eve, starting at sunset on 23 June, is the eve of celebration before the Feast Day of Saint John the Baptist. The Gospel of Luke (Luke 1,26–37 Luke 1:36, 56–57) states that John was born six months before Jesus; therefore, the feast of John the Baptist was fixed on 24 June, six months before Christmas according to the old Roman calculation (ante diem VIII Kalendas Iulias). This feast day is one of the very few saints' days which commemorates the anniversary of the birth, rather than the death, of the saint being honored. The Feast of Saint John closely coincides with the June solstice, also referred to as Midsummer in the Northern Hemisphere. The Christian holy day is fixed at 24 June; but in most countries festivities are mostly held the night before, on Saint John's Eve. This holiday is celebrated in many places. 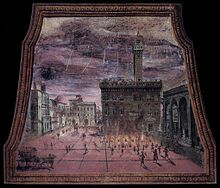 17th century A.D. Saint John's Eve festivities at the Piazza della Signoria. Saint John's Day, the feast day of Saint John the Baptist, was established by the undivided Christian Church in the 4th century A.D., in honour of the birth of the Saint John the Baptist, which the Christian Bible records as being sixth months before Jesus. As the Western Christian Churches mark the birth of Jesus on December 25, Christmas, the Feast of Saint John (Saint John's Day) was established exactly sixth months before the former feast. Within Christian theology, this carries significance as John the Baptist "was understood to be preparing the way for Jesus", with John 3:30 stating, "He must increase, but I must decrease"; this is symbolized in the fact that the "sun begins to diminish at the summer solstice and eventually increases at the winter solstice." By the 6th century A.D., several churches were dedicated in the honour of Saint John the Baptist and a vigil, Saint John's Eve, was added to the feast day of Saint John the Baptist, with Christian priests holding three Masses in churches for the celebration. the wealthier sort also before their doors near to the said bonfires would set out tables on the vigils furnished with sweet bread and good drink, and on the festival days with meats and drinks plentifully, whereunto they would invite their neighbours and passengers also to sit, and to be merry with them in great familiarity, praising God for his benefits bestowed on them. These were called bonfires as well of good amity amongst neighbours that, being before at controversy, were there by the labour of others reconciled, and made of bitter enemies, loving friends, as also for the birtue that a great fire hat to purge the infection of the air. On the vigil of St John Baptist and St Peter and Paul the Apostles, every man's door being shadowed with green birch, long fennel, St John's Wort, Orpin, white lillies and such like , garnished upon with garlands of beautiful flowers, had also lamps of glass, with oil burinin in them all night, some hung branches of iron curiously wrought, containing hundreds of lamps lit at once, which made goodly show. These fires (commonly called Saint John's Fires in various languages) were bonfires that were lit in honour of St. John on Saint John's Eve and Saint John's Day, and served to repel witches and evil spirits. Saint John's Day is also a popular day for infant baptisms and in the 19th century, "baptisms of children who had died 'pagans' were acted out". In Sweden, young people visited holy springs as "a reminder of how John the Baptist baptised Christ in the River Jordan." In addition, historically, "it was a custom to carry lighted torches on Midsummer-eve, as an emblem of St. John the Baptist, who was 'a burning and shining light,' and the preparer of the way of Christ." On Saint John's Eve, goatsbeard and masterwort were fashioned into a cross and then were taken to one's local church, where they were blessed by a Christian clergyperson. Today, common Saint John's Eve and Saint John's Day traditions include processions, church services, Saint John's bonfires, fireworks, and feasting. Fire of St John's Eve in Quimper. Fire is the most typical element associated with the Saint John's Eve celebration. In many countries, such as Croatia, bonfires are lit on the evening of 23 June for people to jump over. In Croatia, the feast is called Ivanje (Ivan being Croatian for John). It is celebrated on June 23, mostly in rural areas. Festivals celebrating Ivanje are held across the country. According to the tradition, bonfires (Ivanjski krijesovi) are built on the shores of lakes, near rivers or on the beaches for the young people to jump over the flames. The Danes often meet with family and friends to have dinner together. If the weather is good, they then proceed to a local bonfire venue. Here the bonfire with the effigy of a witch on top is lit around 10 pm. Beforehand, a bonfire speech is often made, at large events normally by a well-known person. According to popular belief, St John’s Eve was charged with a special power where evil forces were also at work. People believed that the witches flew past on their broomsticks on their way to the Brocken. To keep the evil forces away, the bonfires were usually lit on high ground. Placing a witch – made of old clothes stuffed with hay – on the bonfire is a tradition which did not become common until the 20th century. In some rural parts of Ireland, particularly in the north-west, Bonfire Night is held on St. John's Eve, when bonfires are lit on hilltops. Many towns and cities have "Midsummer Carnivals", with fairs, concerts and fireworks, around the same time. In County Cork in southwest Ireland the night is commonly referred to as bonfire night and is among the busiest nights of the year for the fire services. Traditionally, women collect several species of plants on St. John's eve. These vary from area to area, but mostly include fennel, rue, rosemary, lemon verbena, mallows, laburnum, foxgloves and elder flowers. On the Feast of St. John, it is customary to gather the perennial herb "St. John's Wort". Since medieval times, the herb has been hung over doors, windows and icons to keep witches and evil spirits away. It is also used medicinally, and was used thus by the Knights Hospitaller. In some areas, they are dipped in a vessel with water and left outside, exposed to the dew of night until the following morning, when people use the resulting flower water to wash their faces. goatsbeard and masterwort are traditionally fashioned into a cross and then are taken to one's local church, where they are blessed by a Christian clergyperson. Yarrow has been used since ancient times for healing wounds, and its essential oil has anti-inflammatory properties. Yarrow was also used as a ward against evil, and traditionally it was burned on the eve of St John's Day. Bracken (Pteris aquilina) is sometimes called "brake" or "female fern". The minute spores of this fern were reputed to confer invisibility on their possessor if gathered at the only time when they were said to be visible, i.e., on St. John’s Eve at the precise moment at which the saint was born. In Denmark, the celebration is called sankthans or sankthansaften ("St. John's Eve"). It is the day when the medieval wise men and women would gather special herbs that they needed for the rest of the year to cure people. In Galicia these herbs are called herbas de San Xoán. Normally seven types of herbs are left all night to dew in a tub of water. Modest Mussorgsky's composition Night on Bald Mountain was originally titled St. John’s Night on the Bare Mountain. The first version appeared in 1867 and was revised around 1872 and again in 1880. In this last version he added a hauntingly beautiful quiet ending; in which a church bell announces the dawn, and daybreak chases away the evil spirit. Night on Bald Mountain has remained an audience favorite ever since its appearance in Walt Disney’s landmark movie, Fantasia. Customarily, in Connaught, Ireland, a special dish called "Goody" was made. This was white 'shop-bread' which had been soaked in hot milk and flavored with sugar and spices. It was usually made in a large pot that was either placed on the communal bonfire or heated on a smaller fire close by. Revelers brought their own spoons and bowls if they wanted to share in the "Goody". St. John's Eve is typically celebrated with a bonfire called Saint John's Fire, as at the Château de Montfort (Cote-d'Or), France. The Feast of Saint John, by Jules Breton (1875). Saint John's Eve (Sankthansaften) is celebrated in the same manner in Denmark as the Walpurgis Night is in Sweden. At dusk large bonfires are lit all over the country, typically accompanied by communal singing of Midsommervisen by Holger Drachmann. Atop each bonfire often an effigy of a witch is placed (harking back to the days of witch trials, when real women were burned at the stake). The origin of this custom is a Danish folk belief that Saint John's Eve is also the night of a witches' meeting on the Brocken, the highest peak in the Harz Mountains in central Germany. Midsummer Eve Bonfire on Skagen Beach (1906), an artistic depiction of the traditional Danish bonfire. Traditionally, the bonfires were lit to fend off witches, but today - when the witch effigy catches fire - she is said to be "flying away to Brocken", which can be interpreted as helping the witch on her way. 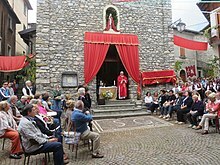 On Saint John's Eve and Saint John's Day, churches arrange Saint John's services and family reunions also occur, which are an occasion for drinking and eating. The feast of St. John the Baptist, is one of the quarter days in England. The town of Midsomer Norton, in Somerset, England, is sometimes said to be named after the Feast Day of St John the Baptist, which is also the parish church. Wynkyn de Worde (d. 1534) of old England cooked a special soup for the occasion in the manner of his ancestors. It was the custom in Yorkshire for every family who had come to live in the parish within the last year to put a table outside their house, on St. John's Eve, and place on it bread and cheese and beer and offer this to anyone who passed by. Any of the parish might help themselves, and if the fortunes of the family ran to it, would be invited indoors for a further supper and a festive evening. By this means the newcomers to the parish made many acquaintances and friends, and were helped to see themselves as having a definite place in the local community. Estonians celebrate "Jaaniõhtu" on the eve of the Summer Solstice (June 23) with bonfires. On the islands of Saaremaa and Hiiumaa, old fishing boats may be burnt in the large pyres set ablaze. On Jaaniõhtu, Estonians all around the country will gather with their families, or at larger events to celebrate this important day with singing and dancing, as Estonians have done for centuries. The celebrations that accompany Jaaniõhtu carry on usually through the night, they are the largest and most important of the year, and the traditions are almost identical to Finland and similar to neighbours Latvia and Sweden. In France, the "Fête de la Saint-Jean" (feast of St John), traditionally celebrated with bonfires (le feu de la Saint-Jean) that are reminiscent of Midsummer's pagan rituals, is a Catholic festivity in celebration of Saint John the Baptist. It takes place on June 24, on Midsummer day (St John's day). Nowadays it is seldom celebrated. In certain French towns, a tall bonfire is built by the inhabitants in order to be lit on St John's Day. In the Vosges region and in the Southern part of Meurthe-et-Moselle, this huge bonfire is named "chavande". Besides many Midsummernight festivals, the Mainzer Johannisnacht commemorates the person Johannes Gutenberg in his native city since 1968. In Quebec, Canada, the celebration of St John's Day was brought to New France by the first French colonists. Great fires were lit at night. According to the Jesuit Relations, the first celebrations of in New France took place around 1638 on the banks of the Saint Lawrence River on the evening of June 23, 1636 with a bonfire and five cannon shots. In 1908, Pope Pius X designated John the Baptist as the patron saint of the French-Canadians. On June 21 Hungarians celebrate "Saint Ivan's Night" (Szentiván-éj) (Iván derived from the Slavic form of John, translated as Jovános, Ivános, Iván in Hungarian). The whole month of June was once called Month of St. Ivan until the 19th century. Setting fires is a folklore tradition this night. Girls jumped over it, while boys watched the spectacular. Most significant among the customs of the summer is lighting the fire of Midsummer Night (szentiváni tűzgyújtás) on the day of St. John (June 24), when the sun follows the highest course, when the nights are the shortest and the days the longest. The practice of venerating St. John the Baptist developed in the Catholic Church during the 5th century, and at this time they put his name and day on June 24. In the Middle Ages it was primarily an ecclesiastical festivity, but from the 16th century on the sources recall it as a folk custom. The most important episode of the custom is the lighting of the fire. The feast of Saint John the Baptist has been celebrated in Florence from medieval times, and certainly in the Renaissance, with festivals sometimes lasting three days from 21 to 24 June. Such celebrations are held nowadays in Cesena from 21–24 June also with a special street market. Saint John the Baptist is the patron saint of Genoa, Florence and Turin where a fireworks display takes place during the celebration on the river. In Turin Saint John's cult is also well-established since medieval times when the city stops work for two days and people from the surrounding areas gather to dance around the bonfire in the central square. In Genoa and coastal Liguria it is traditional to light bonfires on the beaches on Saint John's Eve to remember the fires lit to celebrate the arrival of Saint John's relics to Genoa in 1098. Since 1391 on the 24th of June a great procession across Genoa carries the relics to the harbour, where the Archbishop blesses the city, the sea, and those who work on it. Also called a "Tine Cnámh", literally Bone Fire. Often lit by the oldest present, the youngest present would throw in a bone as part of the celebrations. As part of some customs after the dancing and celebrations were over, revellers would bring home a spent ember from the fire, this was thrown into a field to bring good fortune in the year to come. In Jersey most of the former midsummer customs are largely ignored nowadays. The custom known as Les cônes d'la Saint Jean was observed as late as the 1970s - horns or conch shells were blown. Ringing the bachîn (a large brass preserving pan) at midsummer to frighten away evil spirits survived as a custom on some farms until the 1940s and has been revived as a folk performance in the 21st century. In Poland the festival is known as 'sobótki'. Traditional folk rituals include groups of young men and women singing ritual songs to each other. The young women may wear crowns fashioned from wild flowers, which are later thrown into a nearby pond or lake. The boys/young men may then swim out to claim one of the crowns. Bonfires (and bonfire jumping) are also part of the proceedings. There are St John's street parties in many cities, towns and villages, mainly between the evening on the 23rd and the actual St.John's Day on the 24th of June. St John's night in Porto (Festa de São João do Porto) is considered by several guides as one of the best parties in the world. The actual Midsummer, St John's day, is celebrated traditionally more in Porto and Braga. Dancing around the midsummer pole, Årsnäs in Sweden, 1969. This holiday is normally referred to as 'midsummers eve' in Sweden. Originally a pre-Christian tradition, the holiday has during history been influenced by Christian traditions and the celebration of Saint John, but not as much as to it changing name, as in neighbouring Norway and Denmark. A central symbol nowadays is the 'midsummer pole', a maypole that is risen on the same day as midsummers eve. The pole is a high wooden pole covered in leaves and flowers. Participants dances around the pole and sings songs. A popular Saint John’s Eve custom involves people visiting holy springs as "a reminder of how John the Baptist baptised Christ in the River Jordan." Other traditions include eating pickled herring with fresh potatoes, often the first from the seasons harvest, served with sourcream and chives, and often accompanied by drinking snaps. It's one of the biggest holidays of the year in Sweden, and with Sweden being a part of the vodka-belt, feasting and getting drunk is common. On the island of Puerto Rico, which had been named San Juan Bautista, after the saint, by Christopher Columbus, a night-long celebration, called "La Noche de San Juan" is held. After sunset, people travel to a beach or any accessible body of water (e.g. river, lake or even bathtub) and, at midnight, fall backwards into it three, seven or twelve times. This is done to cleanse the body from bad luck and give good luck for the following year. St. John's Fire by Nikolai Astrup, 1912. In Norway, as elsewhere in Scandinavian countries, this event is celebrated with a communal bonfire. In nynorsk, the event is also known as Jonsok, meaning "wake of Saint John". The Johnsmas Foy festivities on the Shetland Isles, where the people are still proud of their Nordic roots also take place in the week building up to the 23/24 June. These may also have their origins in the Scandinavian St John's Eve festivities. The traditional midsummer party in Spain is the celebration in honour of San Juan  and takes place on the evening of June 23. This midsummer tradition is especially strong in north-western areas of Spain, especially in Galicia, where San Xoán festivals take place all over the region; bonfires are lit and a set of firework displays usually takes place. On the Mediterranean coast, especially in Catalonia and Valencia, special foods, such as Coca de Sant Juan, are also served on this occasion. There is also a large festival in Ciutadella, Menorca, along with many other different cities and towns all across Spain having their own unique traditions associated with the festival. In Alicante, Bonfires of Saint John are the most important festival, and take place from 20th to 24th June. Bonfires are also used in the Basque Country to celebrate San Juan Eguna (the feast of St. John the Baptist), which marks the Basque Summer Solstice. In some towns the celebration is supplemented with more festivities and dances. In Castile and León it is highlighted the Firewalking Festival of San Pedro Manrique (Soria), where barefoot men cross the live coals of a prepared bonfire. Historically, this date has been venerated in the practice of Louisiana Voodoo. The famous Voodoo priestess Marie Laveau was said to have held ceremonies on the Bayou St. John, in New Orleans, commemorating St John's Eve. Many New Orleans residents still keep the tradition alive. ^ a b c "The Nativity of Saint John the Baptist: The Midsummer Nativity". The Institute for Christian Formation. 2017. Retrieved 26 March 2018. ^ a b c Watts, D.C. (2 May 2007). Dictionary of Plant Lore. Elsevier. p. 340. ISBN 9780080546025. There is a record, too, of a Swiss charm in the form of a cross made from dried pieces of Goat's Breard (Spiraea aruncus) and Masterwort (Astrantia major). They were made on St John's Eve, and taken to church on St John's Day to be blessed by a priest, and were reckoned efficacious against lightning, fire and storms. ^ "June 24: The Nativity of John the Baptist – The Rumbling in the Wind". Retrieved 24 June 2018. ^ McNamara, Beth Branigan (2000). Christian Beginnings. Our Sunday Visitor. ISBN 9780879730765. In England, "Saint John's Tide" is combined with a midsummer celebration. Instead of the date of the summer solstice, they chose June 24. This may be because of the Baptist's own words, "He must increase, must decrease" (John 3:30). John was, of course, referring to Jesus. John's day comes at the time when the sun is beginning to decrease, and six months later, Christmas, comes at the time when the sun is beginning to increase. ^ Tornabuoni, Lucrezia (2001). Sacred Narratives. University of Chicago Press. p. 216. ISBN 9780226808529. ^ a b c d e f g Hutton, Ronald (1996). The Stations of the Sun: A History of the Ritual Year in Britain. Oxford University Press. pp. 312–313. ISBN 9780198205708. ^ Dahlig, Piotr (2009). Traditional Musical Cultures in Central-Eastern Europe: Ecclesiastical and Folk Transmission. Dahlig. p. 68. ISBN 9788389101860. The dangers posed to humans by demons require specific rituals, aimed at identifying witches and putting them to death. 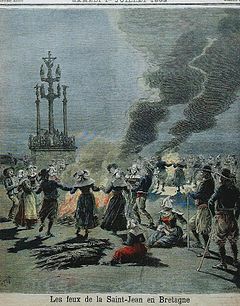 A key element of May Day or St John's rituals is the burning of witches or the repelling and burning-out with fire of evil forces, which might deviously conceal themselves among people, for instance in the form of animals. ^ Reis, João José (20 November 2003). Death Is a Festival: Funeral Rites and Rebellion in Nineteenth-Century Brazil. University of North Carolina Press. p. 101. ISBN 9780807862728. Like 8 December, the eve of St. John's Day was a highly popular date for nineteenth-century christenings. According to old midwives, the baptisms of children who had died "pagans" were acted out: "On this day, at nightfall, a candle is lit in the praise of St. John. The woman who stands godmother prays the Credo before the candle for little angel and says: 'I baptize you, So-and-So, I baptize you in the name of Almighty God the Father'... If [the child] is not baptized, it will cry in its grave every night." ^ a b "Midsummer". Government of Sweden. 10 January 2018. Retrieved 25 March 2018. In Sweden, they were mainly found in the southern part of the country. Young people also liked to visit holy springs, where they drank the healing water and amused themselves with games and dancing. These visits were a reminder of how John the Baptist baptised Christ in the River Jordan. ^ Lapointe, Richard; Tessier, Lucille (1988). The Francophones of Saskatchewan: a history. Campion College, University of Regina. p. 189. ISBN 9780969265825. The feast of Saint John the Baptist on June 24 was observed in all of Quebec with religious services, patriotic speeches, parades and floats. The movement soon spread to Ontario, the New England states, and even to Chicago and the distant state of Oregon. At the end of the nineteenth century, the Saint-Jean-Baptiste Society was the largest secular Franco-Catholic institution in North America. French Canadians in Saskatchewan also celebrated their patron saint's feast day. In Battleford, they seem to have begun to mark the occasion before 1885. It is known definitely that in May 1890 a meeting was held to revive the local Saint-Jean-Baptiste Society, inactive since the Batoche uprising. The festivities on June 24 of that year began with a Mass celebrated at an altar on which stood a statue of Saint John the Baptist with a beaver at his feet and a banner bearing the inscription "Faith - Nation - Unity." ^ "VilaWeb - Diari escola: Saint John's Eve". ^ a b "St. John's Eve, The official website of Denmark". ^ a b "St. John's Eve in old Ireland - World Cultures European". ^ "FaithFact, November 2007". Our Sunday Visitor. ^ "Liturgical Year : Activities : St. John's Eve Bonfire". ^ "Liturgical Year : Activities : St. John's Eve". ^ Matthew Hancock. "There's only one São João". the Guardian. ^ San Juan%5d (St. John the Baptist) "San Juan, Edición del jueves, 29 junio 1933, página 1" Check |url= value (help). Spanihunlimited. ^ "San Juan Festival - Bonfires of Saint John". Spanihunlimited. ^ "Paso del Fuego (fire walking) and Las Móndidas festival. Festivities and traditions in San Pedro Manrique, Soria at Spain is culture". Wikimedia Commons has media related to St John's Eve. The Eve of St. John. A poem by Letitia Elizabeth Landon (1822). This page was last edited on 18 April 2019, at 15:44 (UTC).